I’ve been on a cookbook kick lately and when I saw this the other day I couldn’t resist it. I love that it has a collection of “the best of the best”. Here, in one definitive volume, is Food & Wine Magazine’s collection of the most exceptional recipes from the 25 best cookbooks of the year. 115 Delicious recipes, all vigorously tested by the cooks at Food & Wine, for everything from salads and soups to pastas, chicken and desserts. The latest dishes from superstar authors such as Jacques Pepin, Bobby Flay, Mario Batali & Nancy Silverton along with simple, fail-safe wine pairings. More than 20 exclusive, never-before-published recipes, including Smoky Eggplant Dip, Braised Chicken Thighs with Green Olives, Crispy Fresh Salmon Cakes and Lemon Cloud Cake. There are so many recipes in this book that I want to try. I went through the book pretty fast because I wanted to check out all the recipes, so I’ll have to go back through it and mark them with Post-it tabs. There’s something for everyone in this cookbook, even desserts. I think this is a great addition to any cookbook collection. Food and Wine has published a lot of great recipes, so this cookbook would have a lot going for it. However, I’m a big addict of web searching for them, including on the Food & Wine website. So I wonder if I would need to use up shelf space for this book! I do most of my recipe searches online too, but I love collecting cookbooks so I have a few shelves just for them. I like the idea of pulling together the best recipes and cookbooks of the year together in one volume. 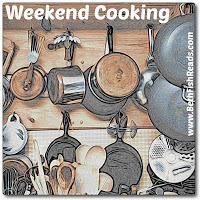 You’ve listed some recipes (especially Crispy Fresh Salmon Cakes) and cookbooks I’d like to check out. Thanks Vicki. I love the variety of cookbooks mentioned! Anything from Smitten Kitchen will be good and the same can be said of Michael Symon’s food. This looks like a great resource and fun to flip through. I’ll have to look for it! So many recipes, so many cookbooks, it’s hard to limit oneself. I’ve been buying produce that looks exceptionally good, then looking up recipes by the various chefs to see which appeals most. I’ll see if our library has this one. 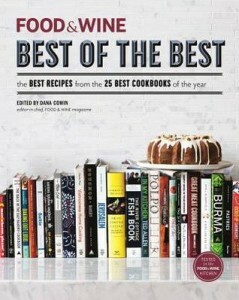 I always enjoy a best of the best book and F and W has some great recipes. We had several of these books at our bookshop and I picked up a few myself. There are so many great recipes in there, it’s hard to know what to make first. I love this idea for a cookbook! I’m going to have to look for a copy next time I’m at the store. I don’t think I would have been able to resist either. We had a great wine pairing book, no recipes, but you couldn’t go wrong with it. We drink a bit of wine here, probably should cut back, ha. What a great book, and sounds like some mighty good recipes. I’m a sucker for books like these! And love using the post-it tabs as well. Just wish my husband drank wine so I wouldn’t feel so lonely drinking it at dinner. LOL! New York Breakfast Casserole sounds good — even though it’s supper time! Your posts always make me want to start cooking. This book sounds great. I need no more cookbooks, but I love F&W! Ok this sounds like another winner for me. I sold most of my cookbooks when we moved to Florida but this is one I’ll definitely want to add to my pared down collection. Thanks for bring it to our attention.